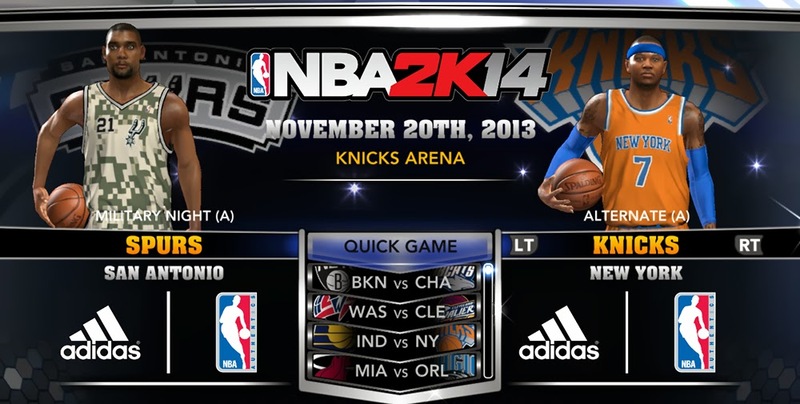 This morning's NBA 2K14 roster update includes unlock of two jerseys. New York Knicks orange alternate and San Antonio Spurs military night camouflage uniforms are now available to use in the game. Also, the 11/12 and 11/13 NBA transactions have been reflected in the roster. Diante Garrett (PG)  has been added to the Utah Jazz, and Josh Childress (SF)  & Lou Amundson (PF)  to the New Orleans Pelicans. Injury status, team rotations, ratings and attributes have been updated as well for a number of players. Check out the list below for an in-depth overview. 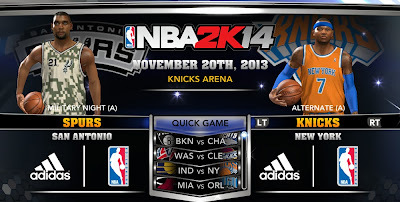 2K Sports uploaded two 11/20 rosters on 2K Share, make sure to get the most recent to take advantage of the full update. For PC users who can't access the 2K Share, you can download and install the offline update patch below.